As racial tensions rise and economic gaps widen, football has emerged as a particularly valuable tool for conflict resolution and peacebuilding. 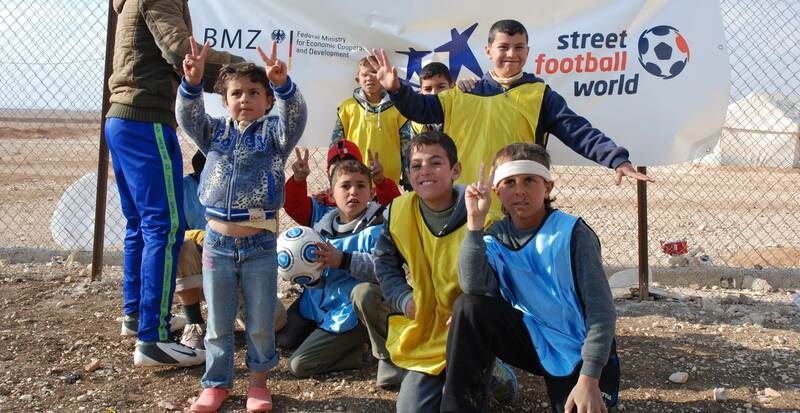 This is no more evident than in Jordan, where streetfootballworld teamed up with The Cross Cultures Project Association and The Asian Football Development Project to launch Kick for Hope – Dialogue for Peace in 2014. Based on successful practices developed across the Middle East, the programme engages young Syrian refugees and Jordanian children in community trainings, trauma coaching and inclusive football activities. Dialogue for Peace also establishes safe, inclusive places for its participants to play and learn, both in refugee camps and host communities along the Syrian border. These spaces are then used to teach young people affected by the Syrian civil war how to implement activities that engage traumatised children and foster peaceful relations amongst refugees and hosts alike. With support from the German Ministry for Economic Cooperation and Development (BMZ), the project has already reached more than 9,000 children and provided them with the opportunity to play together safely and live together peacefully.